Smart Data Retrieval for Amazon Glacier. 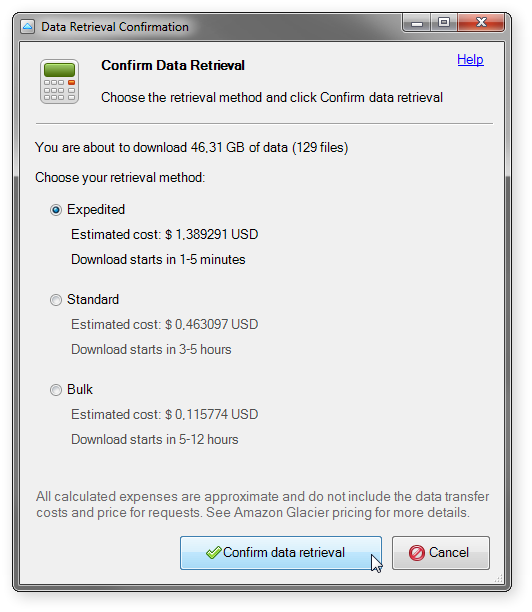 How to control retrieval costs for Amazon Glacier. 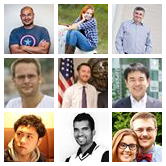 AWS Glacier Calculator. How to restore data from Amazon Glacier. Smart Data Retrieval for Amazon Glacier. Data retrieval calculator for Amazon Glacier. New version of FastGlacier allows you to control your retrieval costs by selecting appropriate retrieval method. Approximate retrieval price is calculated automatically based on the selected retrieval method and amount of data. You can specify how fast the data should be retrieved based on your needs and budget and click Confirm data retrieval to start retrieval process. Please note that displayed prices are approximate and calculated taking into account the fact that there are no other retrievals at the same time.